The recent price action in S&P 500 index is another proof that markets reward risk taking and punish risk aversion. We all know this principle but few are able to actually use it to profit. Those who did not enter the market in early June when most analysts were screaming loud about a coming collapse, have no excuse if they did not enter three weeks later when the game became obvious. Those who did not enter the market when the S&P 500 index made a low at 1,266.74 on June 4 and then rallied 2.9% during the next two trading days had another chance on around June 26 (vertical mark) when it bottomed at the 1,310 level. 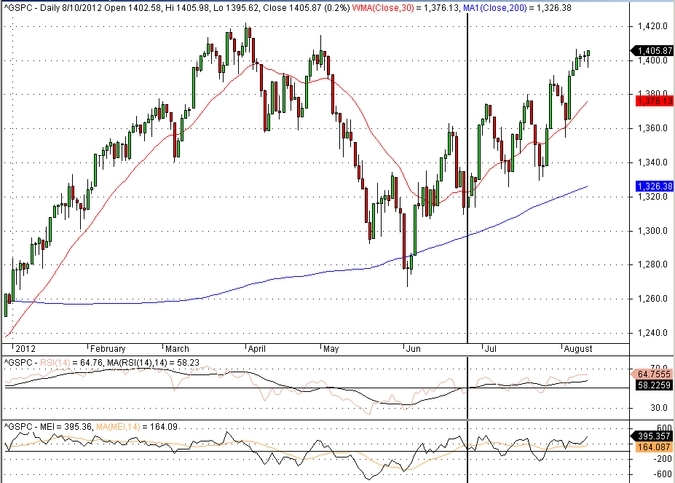 Then, on July 13, I warned about a significant divergence that could be the sign of a major up move. S&P 500 has risen more than 60 points since then. Before that I have warned in the beginning of May that the market will punish those who sell in May and go away. Those who are still on the sidelines, maybe it is better to wait at this point for a few days. Those who just went long after the market reclaimed the “sell in May and go away” trigger level, maybe should reconsider the way they operate and change their philosophy. This market is not for risk aversion but for real risk takers. It was always like that but now this principle has been elevated to a maxim. No risk – no return, no free money anymore, it will get very rough down the road.